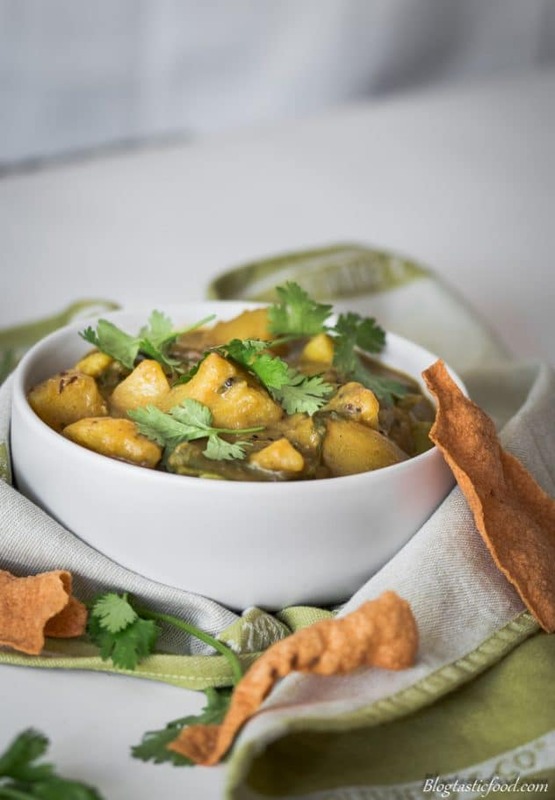 A delicious potato curry that is simple to make and that will easily fill you up. This is a vegetarian recipe but feel free to add whatever you like to it. I absolutely love potatoes, you just can’t go wrong with them, especially if you use them in a curry. As I mentioned, they are great for filling you up and everyone loves them since they are the king (or Queen) of comfort food. This is just another recipe that came from experimenting, rather than doing loads of research to make sure I am doing everything “correctly”. Which is great because it forces me to trust myself a bit more in the kitchen and to embrace my own unique cooking style. I’m sure some of you other food bloggers know what I am talking about. Now although this is a vegetarian dish, all you have to do to make it vegan is replace the ghee with something like vegetable oil. I recommend an oil that can take a lot of heat. As something like olive oil can burn quite easily when cooking on high heat for longer periods of time. And if you would like your potato curry to be spicy, adding some chilli powder or cayenne pepper might be a good idea if you want that extra kick. Since this curry is quite mild. In conclusion, if you want a simple stress-free comfort food dinner, I definitely recommend this recipe. 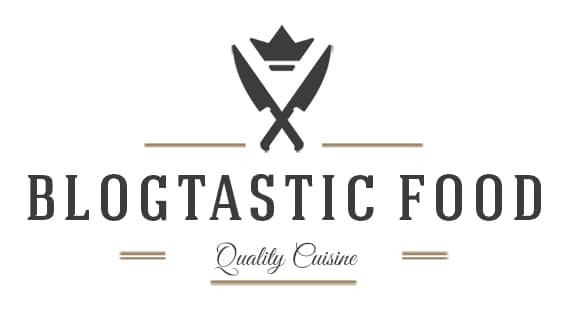 Feel free to subscribe to stay updated with new recipes and have a great day. Much love to you all! 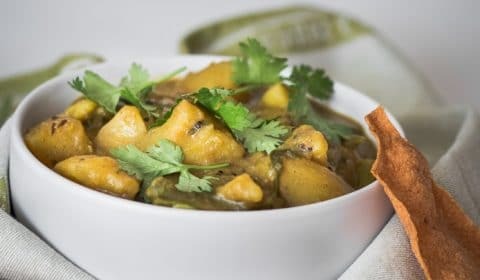 A wonderful stress-free vegetarian potato curry that will fill everyone up, leaving them satisfied. Peel and cut the potatoes into inch thick dices. Transfer them to a large bowl and cover with water so they don't go brown. Heat the ghee up in a large pot over high heat. One the ghee is really nice and hot, add your mustard seeds and fennel seeds, then put your lid on top. You should start to hear the seeds pop. Once the popping has stopped, turn the heat down to about medium, then add your onions and fry them for a couple of minutes. Next, add your garlic and cardamom pods and fry for a further 30 seconds, making sure the garlic doesn't burn. Add your curry powder, garam masala, ground coriander and ground turmeric. Stir the spices through then add your stock. Bring the stock to a boil, drain your potatoes then add them to the curry. Mix 1 tablespoon of water with your cornflour, then add to the potato curry (this will thicken the curry mixture). Bring the curry mixture back up to a boil again, and boil for 15-20 minutes with the lid on until the potatoes are cooked through. Turn the heat down to about low-medium, add your beans, cover with a lid then cook for a further 3-4 minutes. Season the curry to taste with salt and pepper, turn the heat off and finally, add your coriander and stir through. Serve with rice, popadums, bread, whatever you like! Curry is always better the next day! So they make the best leftovers. Don't cook the beans for too long, otherwise, they will lose their texture and vibrancy. And they will turn to mush. Since potatoes are already very filling, I like to serve this dish with some popadoms instead of rice or flatbreads. Thank you for reading through this potato curry post! 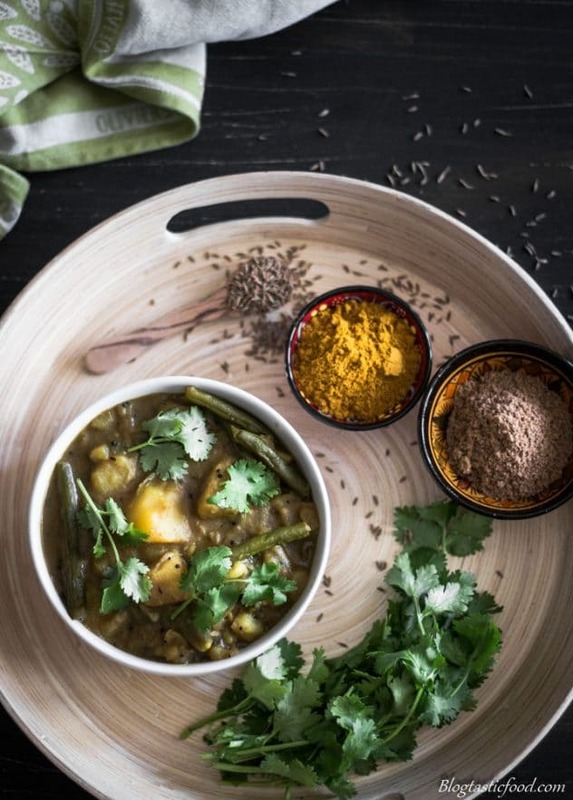 If you want more curry recipes, check out this lamb Rogan josh or this red lentil dhal recipe. Indeed it can, thanks Jen!